To celebrate International Women’s Day, LoveCrochet is proud to support Women for Women International in their incredible #MessageToMySister campaign. In honor of the occasion we’ve collaborated with independent designers to curate an EXCLUSIVE collection of gorgeous PATTERNS where 100% of profits will go to this trailblazing charity! The #MessageToMySister campaign invites everyone to write messages of support and encouragement to women in communities affected by conflict. Women for Women International is asking each of us to reach out and make a difference by telling the women in their programmes, that they’re not alone and that we’re standing alongside them. The crochet community has always proudly stood at the forefront of social justice and community outreach. 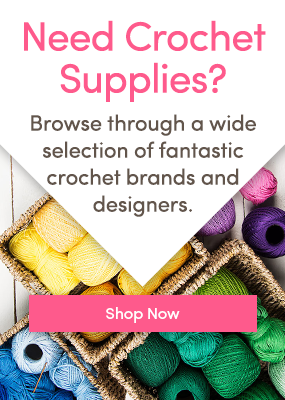 Which is why LoveCrochet is proud to bring you an exclusive collection of patterns in support of Women for Women International. It’s never been a better time to stitch for sisterhood! LoveCrochet is proud to present a special collection of patterns featuring some of our most exciting female designers, including Make & Do Crew, The Crochet Project and Anna Granta. For a limited time only, 100% of profits will go to Women for Women International to support their incredible work. It’s never been a better time to stitch for sisterhood! Because girl power is passed on from generation to generation this fabulous ‘Granny Gives Back’ hooded blanket pattern by Make & Do Crew is a fabulous gift for children or a perfect project to donate to children’s charities! This rich and detailed shawl makes a beautiful crafted gift! Inspired by feisty grandmothers and women who boldly stride ahead, this elegant project is wonderful for the inspirational ladies in your life. These blooming coasters and placemat patterns from Anna Granta are a fantastic way to freshen up your living space, and with the sales going to Women for Women International, you’ll be brightening up another woman’s day in the process! To find out more about the #MessageToMySister campaign and how you can get involved this International Women’s Day click here! You can also follow Women for Women International on Instagram and visit their website.